Tales of Vesperia costumes, chance to win Japanese collector's edition. Bandai Namco will offer a “Day One” Edition of Tales of Hearts R when it launches on November 14 in Europe, the publisher announced. 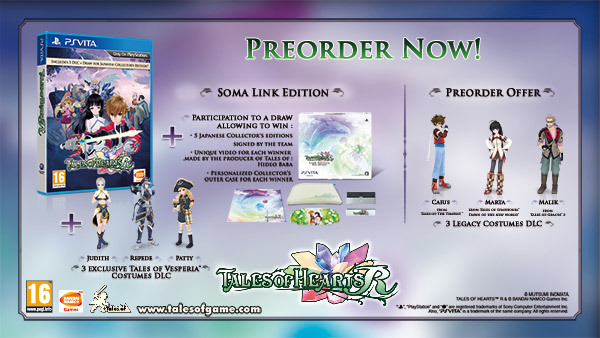 The Day One Edition, also known as the “Soma Link Edition,” includes a set of free Tales of Vesperia outfits for Ines, Kunzite, and Beryl (Judith, Repede, and Patty). A personalized outer case with the name of each winner will be created for the occasion. Tales of Hearts R will launch for PS Vita in North America on November 11.